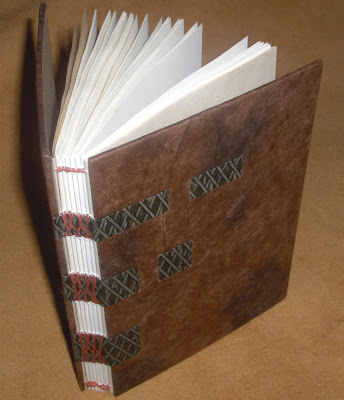 This lovely book was made by Linda, of UniquelyCovered. The binding is on supported tapes and sewn with a French Link. 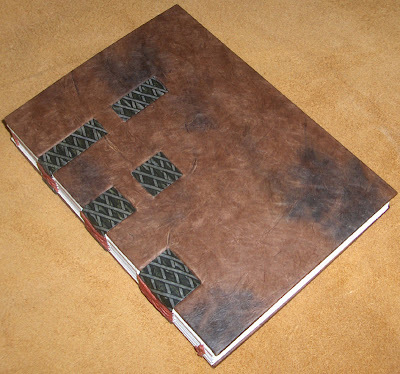 Linda says that this is one of her favorite bindings techniques because of the interest the tapes add when they are woven into the covers. It looks like the tapes are made from paste papers, which is a nice unique touch. Then they are woven into the boards that have been covered with the earthy brown handmade paper. The bright red thread on the spine is a wonderful contrast. ah! two awesome books i won't be getting. the suspense is killing me! I know Meredeth, it's killing me too! This is a very cool bok. Very nicely done. You are very welcome Rhonda. The suspense is killing me too! I love that Lokta paper--it's one of my faves! The stitching on the tapes is wonderful. Beautiful book!